The best stewardship campaigns are continuous, yearlong open discussions and references to resourcing our values. Most people do not give “to keep the lights on”. They give to actualize their values. Successful congregations celebrate their donors just as they do their volunteers. Leadership sets the example in financial commitments and in working the campaign. It’s “The 3 T’s” (time, talent, and treasure), not “pick 2 out of 3 T’s.” We contribute in all 3 categories as best we can. Don’t conduct a budget drive like it’s a new requirement every year. Have a plan. The Stewardship Committee organizes and leads the stewardship effort, but they do not do it alone. Once campaign planning begins, Membership, LSG, Social Justice, the Board, and others should be part of the Stewardship Team. The committee cannot and should not do it alone; we all own this. The mechanical guidelines for good campaigns are well known. 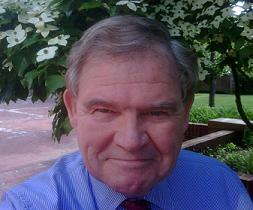 You likely have copies of Wayne Clark’s Beyond Fundraising – read it and use it – it works. Plan on about 10- 12 key people to run a first rate effort. A good, simple theme and visuals help people connect to stewardship. Relate to and put texture to your Mission and Vision statements. Similarly, well-selected and prepared testimonials are powerful. Use them and capture them for reuse. This is about community. If, at the end, people feel part of something, energized, proud of the results, and the amount needed was raised – it’s a great campaign. If they are frustrated, exhausted, and short funds – we failed the community. Data counts, and so does knowing the congregation. Look at people from several perspectives (what quintile of giving are they in, how long have they been here, how active are they, what moves them, income changes, etc.?). Pair them with the right visiting steward. This helps people connect to the larger purpose of the effort. We need not be shy about asking – this is important to us all, so let’s ask. 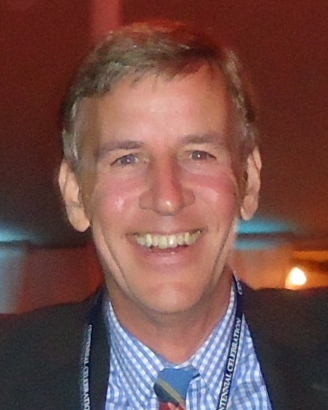 People often need help framing their contribution, especially new members. Make full use of the Fair Share guide. If people want to know the mean and median contribution from last year and the size of our budget, they should have that information, but at best they match their decisions to the Fair Share guide and do not focus so much on what others do. This is their commitment to make. Two things can be helpful. One, have a commitment Sunday wherein the Visiting Stewards and the Congregation exchanges pledges. It’s very powerful to see those stewards standing up front. Two, recognize that many members on fixed income have limited potential to increase. No one should be overlooked or assumed unable to make an increase, but if they cite fixed income, it’s an ideal time to talk about legacy giving. You should have a Legacy Society to recognize and honor those who have put the congregation in their will or estate plans. Encourage people to set up auto pay, making contributions more predictable, with less processing. Ever find yourself asking that question, wondering why your budget drive or capital cam paign is struggling while another congregation’s always seems to do really well? Every congregation and every circumstance are different, of course, but consistently successful campaigns do seem to share a small number of key attributes. Stewardship is ministry. Ensure the leadership and everyone involved in the program remind us all that. This is the lifeblood for the rest of our ministry. Treat it accordingly. We should also be clear this is not just another charity to consider – this is our spiritual home and where we live out our values individually and as a community. This is the priority among the good causes in our lives. The best stewardship campaigns are not, in fact, campaigns. They are continuous, yearlong open discussions and references to resourcing our values – the campaign is just an exclamation point in that continuing conversation. Ensure this conversation is present and visible all year (including with new members), not just pulled out of the closet for 5 weeks every year. Most people do not give “to keep the lights on” or to save a sinking ship. They give to actualize their dreams and values. Stewardship should speak to that; what is it we do programmatically that merits our money (great services, inspiring music, social action in the world, being a just employer, etc.). What difference does my contribution make? What else would we do if we had 5% or 10% more? Give people something real and meaningful to invest in. Successful congregations celebrate their donors just as they do their volunteers. They thank and recognize those who can and do donate, especially Fair Share givers (which avoids celebrating only the large amount donors). Celebrate running successes in numbers contributing, fair share pledges, numbers of households increasing, first time commitments, etc. Leadership sets the example in financial commitments and in working for the campaign. Exceptions should be extraordinarily rare. If the leadership is not committed enough to contribute and to talk to others about doing so, why should anyone else? We remind ourselves that there is a reason we so often cite “The 3 Ts;” not “pick 2 out of 3 T’s.” As responsible members of this community, we are called to contribute in all 3 categories as best we can. The fact that we may volunteer a lot or provide special talents does not lessen our responsibility to provide financial support as we can. Leaders and visiting stewards need to be prepared to have this conversation with those who may feel otherwise. You may have very few resources to share; that makes the sharing no less valued – quite the opposite. Churches often conduct their budget drive like it’s a new requirement – and a surprise – every year. The leadership should have a general plan for what type of campaign (face to face, cottage meeting, etc.) laid out at least 3 years out, if not 4, should know who the chair and vice chair are 2 years out, and should plan on doing face to face about every other year, certainly no less than every 3rd year. In Part II of this blog, we will look at more of these keys to success. The Unitarian Church in Harrisburg provides a great example of generosity in action; volunteers helped to work on Ida Lee Brown’s home, where she has lived for over 59 years. This group of volunteers, part of a team called “Rebuilding Together,” has helped repair homes for individuals facing significant barriers for over 24 years. Read more about The Unitarian Church of Harrisburg and “Rebuilding Together” and share with us some stories you may have that are other great examples of generosity in action in your congregation! Since I belong to a large congregation that is known to be more racially diverse, people I work with in other congregations often ask me what the keys are to growing their own diversity. This is especially challenging to people who are in predominantly white communities. I am not a diversity consultant or expert (and I am a middle aged white guy! ), yet I do think the one thing we can all do, everywhere, is to work on changing ourselves first. That means learning about and practicing anti-racism. Yet transforming us around stewardship is ultimately more challenging. First of all there is the challenge of how you actually do that. What does it look like? How do you measure change (aside from with raw numbers)? Then if there is a change how can you attribute it to something so subtle? Let’s start with this: We have to be more caring, trusting, inspiring, and inviting. We have to raise our heads up from the budget or the pledge numbers and be willing to be in relationship. This will require us, as leaders, to embody a different approach to stewardship. What we do may look similar; we might still have testimonials, and one-on-one conversations, publish a brochure, do mailings, provide financial information, and put out a financial commitment form. Yet our changed underlying approach will suffuse the annual budget drive with collective concern and not create divisions between parts of the congregation. This is our shared endeavor, not we few trying to get you all to respond. In fact, we may have even more of a congregational focus on stewardship; have a greater sense of urgency about it. Yet it will build trust and ownership of the congregation. This takes a new discipline, self-awareness, and sensitivity. And it requires us to look at our congregations more holistically. 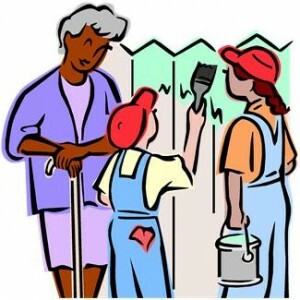 As people I have worked with are used to me saying, “Stewardship affects everything and everything affects stewardship.” If your board is in conflict or there are serious problems in other areas of the congregation, a pledge drive uses pressure and trying to corner people into giving may be enable you to muscle your way through the drive. However, if you are going to embrace stewardship in relationship, in community, then things will need to be well-aligned, or at least honestly worked-on. Without that, the inspiration to give and boldness in giving cannot grow. This is a vision of sustainability in stewardship, where the leaders do not burn out or become cynical. This is a chance for us all to grow together – individually and collectively. 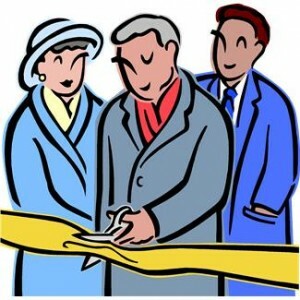 And with this opening and invitation, more people will want to participate, so our capacity to implement our congregational missions may grow as well. Is the Fair Share Giving Guide Fair for Fixed Income Retirees? 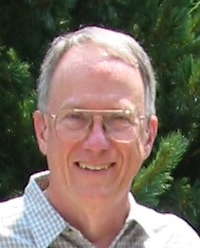 In Beyond Fundraising, Wayne Clark introduced a revised Suggested Fair Share Giving Guide. (SFSGG). The guide is an adaptation and expansion of a model used at the Henry David Thoreau Unitarian Universalist Congregation in Stafford, TX. In my consultations with congregations, I often hear that the SFSGG is unfair to congregants who are retired and living on a fixed income. My response is that it’s pretty normal for these fixed income congregants to be among the highest annual donors. Congregants have two pockets to give from: annual income and secured assets. For those with only annual giving pockets, I suggest that they make their financial commitment based on their adjusted gross income from their IRS forms. Once they have done that, I ask them to consider using the SFSGG to make a Fair Share commitment based on the percent that is suggested for that income level. I have found that these UUs are smart enough to do just that and the good news is that one of two things occur: they look at the chart and decide that with just a little extra level of giving they can be a Fair Share donor. This is particularly true where the dollar value of the gifts is not that high. At the other end of the scale are congregants who have a significant nest egg but haven’t been giving much to their congregation. By checking the SFSGG and their financial capabilities, many congregants are motivated to increase their giving levels. I have found that the SFSGG helps many UUs consider a variety of ways in which they can become more generous to their congregations and feel better about themselves at the same time. Give it a try. Congregational community building and asking for money are an uneasy mix. That does not seem to be as true when trying to combine community building efforts with soliciting other congregant resources: skills, intelligence, time, and physical effort. On the other hand, asking for money (sometimes called fundraising or resource development) in the context of creating the “beloved community” for many folks would seem to be and oil-and-water endeavor. Yet, this might provide the basis for a good definition of stewardship: a combination of community building and resource development. Whether you are concerned about “them” giving enough or not being able to give, you have set up a distinction between who we are and who they are. As a long time lay leader, I can understand how this perspective arises. If we were like Baptists (Jews, Muslims, Buddhists, etc.) they would know exactly how much to give and cultural pressure would make sure they gave at that level. People in other religions give a lot more than we UUs do. If we were all Christians, we could hold up Jesus’ teachings and they would give at the levels we need. We could even talk about heaven and hell! And yet as congregants this will be our spiritual home, for many of us or core community, for a very long time – sometimes a lifetime. We will know each other and grow in relationship for many years. For that reason, setting up a program to gather the financial fuel for the community’ mission based on these dualities (us vs. them, comparing UUs vs. other denominations) can divide the community and be counterproductive. In fact, the dangers of “us vs. them” frames for stewardship in congregations can be profound. In some congregations, people “grin and bear it” through the annual pledge drive, or worse know to avoid Sundays during the period of the drive. Some will probably still contribute and come back because these people value other parts of congregational life enough to figure out a way to live with or work-around the pains of the annual drive. However, if we are not careful, we can break the very community-building that we say is our goal. If people get hurt, offended, or confused because of the way we act or communicate – or because it does not match the rest of our UU values – we are breaking the bonds of beloved community. Over time these small injuries become scars and we run the danger of those people never feeling like they belong in the congregation, or fully engaging in a stewardship relationship there. Stepping into stewardship is challenging. It can be an act of faith and can help us develop along a spiritual path. It calls us to align our values, beliefs, and loves with our financial (and other!) resources. It can create a bridge to belonging so that our congregation truly feels like it is “ours.” And it can provide opportunities for community-building and meaningful conversations. With all of this rich potential, let’s find a way to do stewardship that is enlivening, spirit-filled, and caring for everyone. In continuing in our effort to address engaging young adults in generosity, I have read and reviewed Growing Up Generous: Engaging Youth in Giving and Serving, written by Eugene C. Roehlkepartain, Elanah Dalyah Naftali, and Laura Musegades. 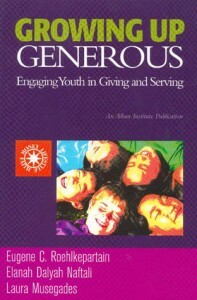 This text, published in 2000, provides timeless tips for nurturing generosity in youth. There is a particular focus in this chapter on faith traditions and their specific connections and experience with stewardship throughout history. There is also a discussion on how to create a culture of generosity in your congregation; there are eight key concepts that the authors list as essential to forming a generous culture. There is a discussion here about youth of today and their particular patterns as consumers as well as information on advertising focused on youth. This chapter also focuses on financial literacy and youth, and the importance of financial education from an early age. There is a deep discussion in this chapter on some of the largest obstacles that we face when addressing stewardship issues with youth. There is recognition by the authors that some adults feel uncomfortable talking about money and that many people may experience financial anxiety. This chapter also addresses some of the stereotypes that individuals often have when concerning youth and money; that they shouldn’t be expected to give, that they don’t have money, or that if they are asked to give they might decide to leave the church. This chapter provides invaluable information about these and many other obstacles that might come up when engaging youth in stewardship but also analyzes these obstacles and explains why they are harmful. This chapter analyzes all-things-service learning, and explains how there has been a movement in recent years of youth being heavily involved in service learning. The authors also explore service learning in and through congregations. Lastly, obstacles that come up for youth engaging in service work are also addressed. There is a focus on how to face the obstacles presented in earlier chapters and logically respond in the most receptive, respectful, and engaging way. The authors discuss developmental assets in youth, and how these assets contribute to healthy youth development, which in turn leads to higher levels of generosity. Additionally, the authors tackle eight cultural shifts that need to occur in congregations in order to effectively nurture generous youth. The final two chapters, Chapter 6: Creating a Culture of Generosity, and Chapter 7: Cultivating the Practices of Generosity focus on eight keys to giving and serving in congregations. The first four keys emphasize creating a generous culture in a congregation, while the last focus on practices of generosity. We hope that this review may assist your congregation with effective strategies to create, or build on, youth stewardship practices. UU buildings come in many shapes and sizes and there are many alternatives to the proverbial white steepled church on the green in the middle of town. The Kingston Unitarian Fellowship is a good example of having taken a different approach to creating a worship space. You can read the full article about the unique worship space of Kingston Unitarian Fellowship and what the congregation is doing the celebrate the renovated building. 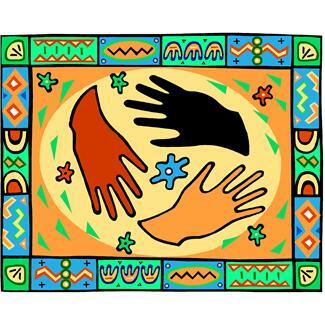 We want our congregations to be welcoming to people of all ages, genders, races, sexual orientation, and economic levels. Our congregations may be Welcoming of LBGT people and handicapped accessible. Yet if we are giving people either specific financial amounts or no guidance about that we expect them to contribute, we are excluding people. They either cannot give at that specific level, or if they are not told something may fear they will not be able to afford whatever the expectation turns out to be. The Suggested Fair Share Giving Guide (SFSGG) allows people to find their own capacity to give and to determine what level of giving they want to reach for. This means that a very low income person can find themselves on the chart and know that they are being just as generous, with their own level of financial resources, as the wealthiest person in the congregation. There is perhaps nowhere else in America where a very low income person and a very wealthy person can give at the same level. The Guide can allow your congregation to be such a place. Let me give you a concrete example. If you were going to have a “Leadership Givers Event” next month, how would you know who to invite? Most congregations would take a list of members, sorted by financial contribution, and invite the top dollar amount givers. That is not a bad thing to do, because you know who those people are – you can identify them easily. And based on the amount they give, you can presume a fairly high level of dedication to the congregation and its mission. Those are folks you want to gather and talk to. However, you are missing an opportunity to invite people who may be just as dedicated to the congregation, and are giving just as generously, yet their resources are more limited. Some of those lower income people may actually be stretching themselves more – and feeling it more strongly – than the higher income folks. If a good number of people in the congregation use the Guide, and are willing to indicate that they do by their own self-report, you will have a better idea of who is being generous to the congregation. And in this instance, their level of financial resources will not divide out people who have more resources from people who have less. Using the Suggested Fair Share Giving Guide, you can provide an environment where congregants can stand together – low, median, and high income. All are welcome, all can feel that they contribute their share, all can feel generous for their own financial contributions. Imagine a leadership givers’ event that includes more than the usual members; it might include people from all socio-economic levels, yet who are dedicated and generous in relation to their own capacity. Now that is economic justice lived in our own congregation!